Isola #1 Review – AiPT! A fun and visually stunning adventure. While there are plenty of superhero and science fiction stories on the comic book racks, by comparison, good fantasy can be bafflingly hard to find. Fortunately, Brenden Flethcher and Karl Kerschl’s gorgeous fantasy tale Isola is here, and it was more than worth the long wait since its announcement. The story begins in media res, as a dutiful knight escorts a strangely colored tiger through a fantasy landscape. We soon find out that this knight believes the tiger to be her queen and is sworn to protect her. Whether the knight is crazy or this is actually the case is not yet certain, but what is immediately clear is that she’s fiercely loyal and utterly beholden to her duty to the queen–and it’s a good thing too, as there are no shortage of people and creatures in the woods that want them dead. We don’t see any flashbacks to a queen drinking a magic potion or any exposition about a family’s royal curse; the creative team smartly assumes that the audience has probably seen it all before. No, instead they decide to hook us in the first issue with the thing that will set it apart if it is to last: the character. From Isola #1, art by Karl Kerschl and Msassyk. Captain Rook is already shaping up to be a fascinating protagonist, as we see her struggle over the course of the issue, not just to keep herself and her royal feline alive, but also how to process what is happening. Clearly, Rook has a deep reverence for her queen, and as Rook tries to figure out the proper way to address or treat the tiger we’re treated to some cute and funny moments of dialogue, but also to some more raw moments of confusion and desperation. Should Rook do everything she can to keep her queen alive, including yelling commands at her? Or is maintaining decorum even more important than ever? I can’t wait to get more backstory on her and see Rook wrestle with the apparent contradictions of her duties as the series progresses. 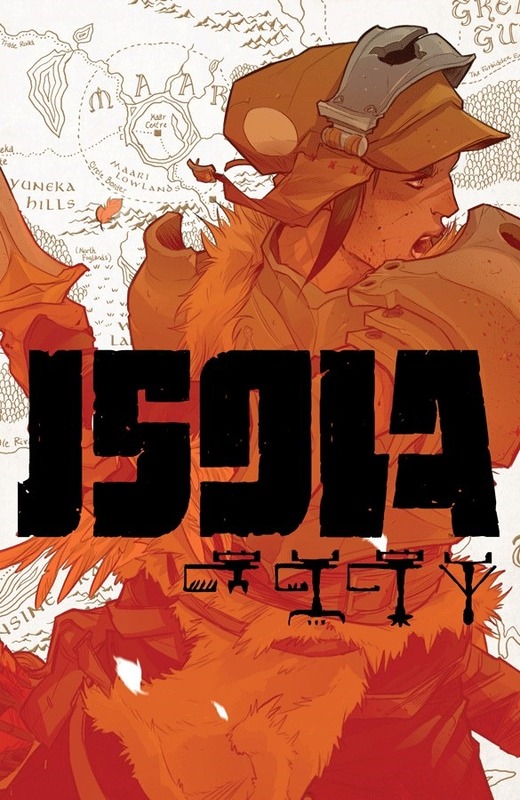 And while that might sound like a lot packed into one issue, Isola #1 actually is relatively light on exposition and doesn’t spoon feed anything to its audience. This is done through smart dialogue choices, but also it’s largely a function of the top-notch art team’s great storytelling. While many fantasy stories pile on flashy worldbuilding with their visuals, Kerschl and Msassyk create a sleek and beautiful aesthetic that is accessible and familiar without being derivative or sparse. This allows the reader to jump right into the story without questioning the setting too much, while still leaving plenty of room for it to be filled with mystery and wonder. There is plenty of European fantasy in the designs, but the overall style feels influenced by Japanese animation and American RPG video games as well, and doubtless there are plenty of other sources of inspiration I missed. The end result is something that has an impressive sense of depth and originality without being too visually weird or burdening the reader with lots of exposition. Kerschl has a talent for drawing characters that are both heroic and inspiring while also being vulnerable and emotional, and Msassyk’s colors heighten those strengths by always making the characters pop against the detailed backgrounds, and filling the book with beautifully moody lighting. The tiger is a particular visual treat as the color and lines work together to make her seem regal and mythic, but at the same time allowing her to feel like a real, living animal, with all the personality that entails. There’s so much to enjoy in Isola that you’ll find yourself re-reading it again as soon as you finish (and digging out your copies of Motor Crush #1-5 to re-read the short Isola prologue included in the back), I know I did. Isola is a fun and visually stunning adventure that manages to capture the universal magic of fantasy while still feeling thrillingly modern and original. Isola #1 is an incredibly promising debut to a refreshingly smart and stylish fantasy adventure.